One of the top returning prospects in the Cape League this summer is mammoth Harwich outfielder Austin Wilson, a right-handed slugger from Stanford. 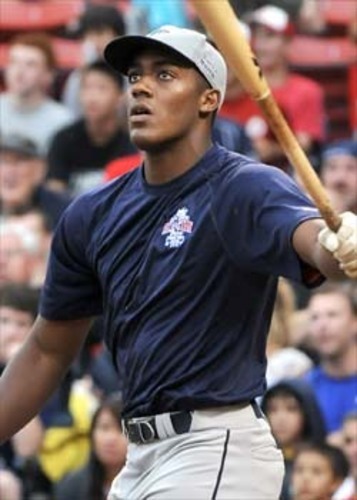 Like many first-year players using wood bats (for the first time) and battling against ace pitchers in the CCBL, the 6-5, 245-pound Wilson struggled most of 2011 with a .204 batting average, one homer, 13 RBI and 11 runs scored. But he caught fire at just the right time, leading the Mariners to the CCBL championship with five RBI and slamming a go-ahead double in a 7-5 title-clinching win over Falmouth. Wilson is currently hitting .311 with five homers and 31 RBI for the No. 10 Cardinal (23-10). A Los Angeles native, he was originally drafted out of high school in the 12th round of the 2010 Amateur Draft by St. Louis, was rated 25th best prospect in the Cape League by Baseball America and ranked the No. 2 prospect in the league by perfectgame.org. Last spring as a freshman, Wilson was named All-Pac-10 Honorable Mention as Stanford’s starting right fielder, batting .311 in 55 games with a team-leading five homers, seven doubles, 25 runs and 30 RBIs. The talented outfielder had 16 multi-hit games and a 12-game hitting streak, raising his average from .288 to .320 paced by a .442 mark. He slammed a three-run double in the NCAA Super Regionals at North Carolina (6/11). He was named a preseason Third Team All-America by Baseball America. The Cape Cod Baseball League will conduct its Annual Frank Finn Cape League Invitational Tryout for all ten Cape League teams, Saturday, June 9 at Spillane Field in Wareham. Directions are listed on the Gatemen website: www.gatemen.org. and the tryout is by invitation only. Players must be recommended by their college coach. Coaches may recommend players who they believe can compete at the Cape League level. The try-out will be under the auspices of CCBL representatives at Spillane Field. Organization and administration will be handled by Cotuit Asst. GM Sue Pina (508-291-5834, FAX 508-957-8677 or sp@kettleers.org). Please direct all communication to Ms. Pina. Wareham field manager Cooper Farris was inducted into theDelta State Sports Hall of Fame on April 13. Farris, who’s managed the Gatemen the past 12 years, directed Gulf Coast CC for 19 years. A former Delta State second baseman, the Gulfport, Miss., native coached Gulf Coast to a 698-299 record. Farris began his coaching career for former Red Sox ace David “Boo” Farris at Delta State in 1976-77. The 1977 Statesmen advanced to the NCAA Division II World Series. 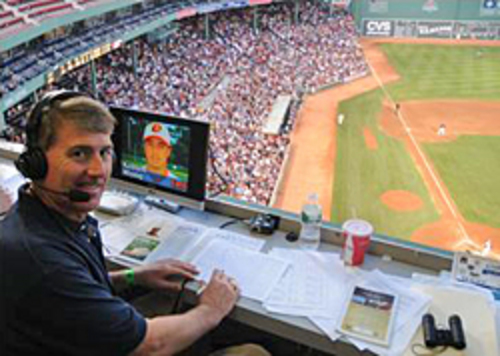 After a successful high school career, Farris has coached in the Shenandoah Valley Collegiate League (1996-2000) and the Cape Cod League since 2001, claiming the league title for the Gatemen in 2001-02. Farris has coached 36 MLB players, including 1996 St. Louis Cardinals World Series MVP David Eckstein. The Chicago White Sox feature a strong cast of former Cape Leaguers including new manager Robin Ventura (Hyannis ’87), outfielder Brent Lillibridge (Harwich ’04), second baseman Gordon Beckham (Y-D ’07) and the dynamic pitching duo of Phil Humber (Y-D ’03) and southpaw Chris Sale (Y-D ’09). The hard-throwing Sale pitched 6.1 innings, allowing three runs, seven hits and three walks while striking out a career-high 11 to earn the win against Seattle last Friday night (April 20) and the next day Humber hurled a perfect game against the Mariners…Evan Longoria (Chatham ’05) went 3-for-4 with a HR and 4 RBI in a 9-4 win over Toronto…Mark Texeira (Orleans ’99) slammed two home runs and drove in six runs in the Yankees’ 15-9 slugfest win at Boston…San Francisco catcher Buster Posey (Y-D ’06-’07) is hitting .375 with two HR and 8 RBI. Giants’ teammate Barry Zito (’97-’98) is 1-0 with a 1.71 ERA, while Tim Lincecum (Harwich ’05) earned his first win in a 6-1 victory over the NY Mets. The two-time National League Cy Young Award winner worked just five innings in the win, but struck out eight batters. Posey drilled a solo homer for the Giants and Emmanuel Burriss (Orleans ’05) helped turn a double play…Ryan Braun (Brewster ’04) is batting .258 with three HR and nine RBI for Milwaukee. Brewers’ teammate Shaun Marcum (Harwich ’02) is 1-1 with a 3.79 ERA…Brandon Morrow (Y-D ’04-’05) is 1-0 with a 4.50 ERA for the Blue Jays and leads the AL with six HR allowed…Former Cape League MVP AJ Pollock (Falmouth ’08) started in centerfield for the Arizona Diamondbacks last week. The only Cape League hitter in the modern era (1963-present) to hit over .500 was Ken Voges of Chatham who batted .505 in 1963…Cory Snyder holds the CCBL record for most home runs in a season (22) set in 1983 with Harwich. The league wood bat record is held by Dave Staton with 16 for Brewster in 1988…Pat Hope holds the CCBL record for most wins (11) and complete games (13) for Hyannis in 1987. One of the best scouting reports came from an early 20th century letter to Washington Senators owner Clark Griffith on a young, flame-throwing pitcher named Walter Perry Johnson. It read: “He knows where he’s throwing because if he didn’t, there would be dead bodies strewn over Idaho.” The “Big Train” won 413 major league games and completed 532 games, a record 112 shutouts and 3,499 strikeouts in an inaugural Hall of Fame career. He won 20 or more games 12 times, including 30-win seasons in 1912 (33-12, 1.39 ERA) and 1913 (36-7, 1.14 ERA) and is widely considered the greatest pitcher who ever lived. The next Cape League executive committee meeting is scheduled for Wednesday, May 2 at the Hyannis Youth & Community Center and the board of directors meeting is slated for Wednesday, May 30 at HYCC at 6 pm.